Clogged Drain? Disgusting…But we have your back when it comes to backups. Drain Cleaning is not the most glorious of professions, however, it’s a necessary one. The smells, the mess, the inconvenience, we understand it all and can eliminate it all. We rarely realize how important our Drains are and how much we rely on them until they are out of commission. Rooter Right Plumbing & Drain can help; we Specialize in all types of Drain Cleaning and have the knowledge and equipment to tackle any Drain issue, big or small. *Look below to view our complete list. Sometimes Drain issues are let go for too long and the pipe just isn’t worth saving anymore, other times, it’s more economical to start with new rather than cleaning the existing lines. No matter the cause or reason, we have the ability to Repair Any Drain. 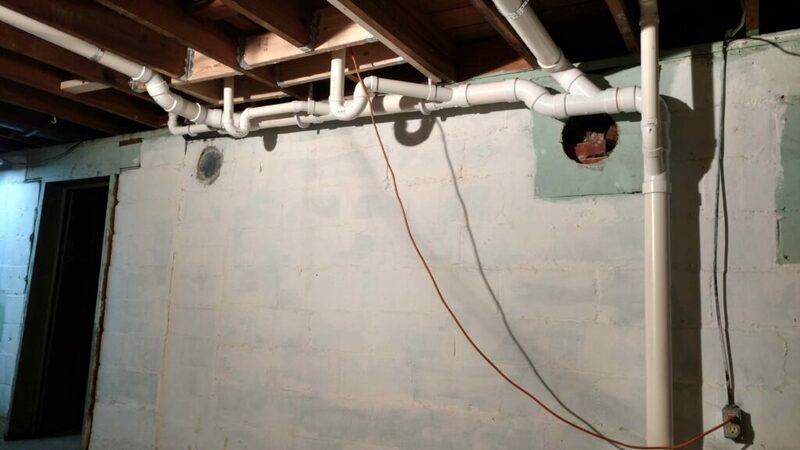 Older homes often have galvanized Drain Lines. With galvanized pipe, it can look like the pipe is in great shape on the outside, but in fact, on the inside it is rotting away. Water running down that same path day after day for years can make the bottom of your Drain Lines very thin. Once this occurs it makes the pipe extremely vulnerable to breakage. Old metal traps underneath sinks fall prey to this same process, getting progressively weaker every time water is passes through. Updating old cast iron and old galvanized to PVC piping is a great way to get ahead of the trouble that can come with Drain Line Breakage. Although you may be unaware, your Home or Business could have an entire network of Drain Lines underground. This can make access quite a challenge when it comes to making repairs on those lines. Many homes and buildings have the majority of their Drain Lines under concrete floors. This can make repairs quite difficult. 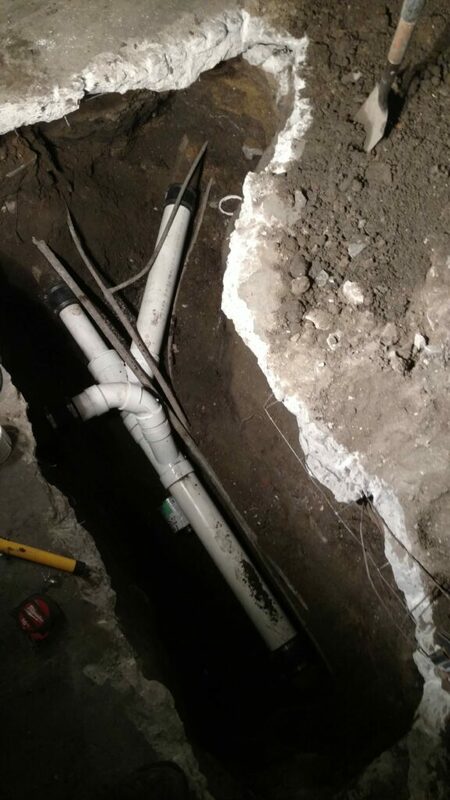 Rooter Right’s technicians are very Knowledgeable and well equipped to handle any Underground Repair. We have a multitude of concrete cutting, concrete breaking, and Excavation equipment that allows us to make quick work of any Underground Repair. In most cases we also re-pour and finish new concrete in place of the old concrete removed for the repair. So whether your Underground Repair is inside a Home or Business, or outside a Home or Business, we are your one stop solution. 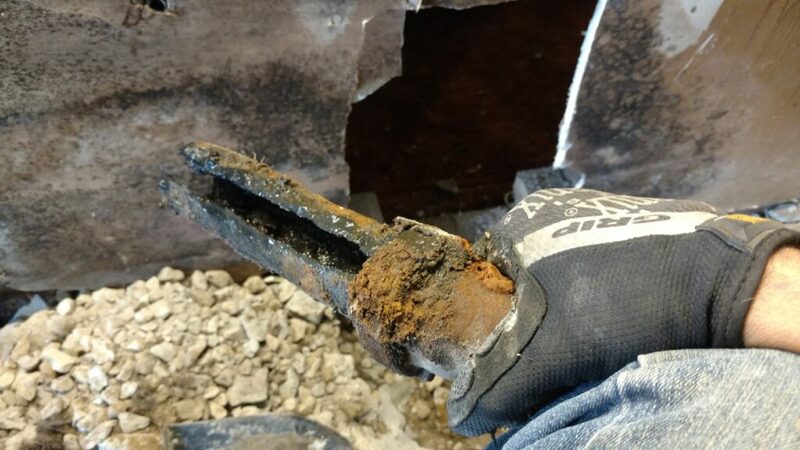 Clogged Drain Lines can be very disruptive to the normal function of your Home or Business, and we realize that often times Drain Issues will arise at the most inconvenient times. Rooter Right has you covered, we offer Drain Cleaning, as well as many other Plumbing Related Services, 24/7. If you have an Emergency, call the Professional, Licensed, Drain Cleaners at Rooter Right to get to the root of your problem. We have a number of different Drain Snakes and Drain Cable Machines to accommodate every situation that can present itself. We have machinery specially designed for Sewer Cleaning, Kitchen Sink Drains, Bathroom Sink Drains, Toilets, Urinals, and every other kind of Drain. The first line of defense against drain trouble is Drain Snaking. With years of experience, our Technicians can tell you a lot about a Drain just from the feel and the sound of our cleaning equipment, almost like an extension of the hand. We have the right machine for every problem and the ability to push them to their full potential. In some instances Drain Cables need a boost to free certain kinds of Clogs, this is where our Jetting equipment comes into play. When your line is full of grease or sludge and the Snake just cant seem to get things moving fast enough, we bring in the Water Jetter. The Jetter Clears Drains using a large volume of Water at a High Pressure to Blast through Clogs and Loosen Sludge and Grease. Think of it as power washing for the inside of your Drain Lines. The large amount of water thins out heavy sludge creating a greater degree of fluidity, which helps it move through the line and out to the next larger branch, or the main. This technique is helpful in scenarios where there is very little fall or slope in a pipe, the line is extremely long, or it has what are known as “bellies”. “Bellies” are areas in the line where the pipe dips down below the grade and then comes back up, creating a pocket. In these pockets solids often deposit. When deposits build up over time they lead to the clogging of the line. Another common issue that the Jetting Equipment tackles well is sand or sediment in pipes. Sand and dirt deposited in pipes is very difficult for the normal stream of water to push out. With the Jetter, we can use High-Pressure Water streams to either push or pull sediment build up out of your lines.